Japan is a destination popular with tourists of all nationalities. One of the main reason is that this country manages to combine cultural traditions and modern technologies in a beautiful and harmonious way. However, the boundaries between these two dimensions are often unclear and hard to understand especially for a foreigner. A lot of traditional shrines and temples are for example equipped with automated fortune telling machine taking the shape of Robot-Dragons. Put a coin in, then the dragon will dance and give you a random fortune. As a matter of fact, in Tokyo it is even possible to enjoy a traditional tea ceremony while hearing as a background the noises of promotional trunks putting forward new J-POP bands or animates. Yet, I recently had the wonderful opportunity of assisting to a Noh performance within the national theatre of Hosho Nogakudo. Japanese traditional theater performances are divided into two categories: Noh and Kabuki. The latter is the most popular since the style and the language used have both evolved throughout the years. In contrast, Noh performances are regulated by a strict code put in place several centuries ago (iemoto system). As a result, NOH performances look like frozen in time and allow carrying the visitor into another world, into another Japan no more accessible today, a Japan in which modern technologies were still unknown. 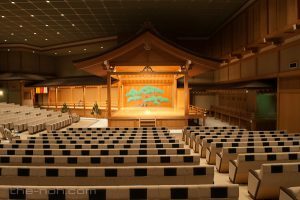 Since NOH has not evolved throughout the centuries, old Japanese is still used during the performances and, even if similarities with modern Japanese are obvious, old Japanese is no longer understood in Japan. This aspect is very important since it finally allows the auditors (both Japaneses and foreigners) to focus on the quivering emotions emerging from the dances and the songs rather than on the story itself. The NOH performance I assisted was wonderful in its slow but increasing rhythm, slightly evolving in a definitely trance style. 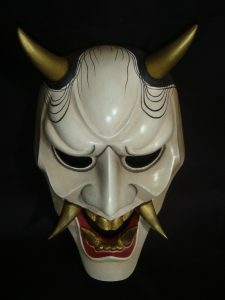 The grand finale scene characterized by the apparition a demon (Hannya mask) was particularly spectacular. This is so far the most amazing traditional experience I had in Japan. I cannot recommend NOH enough for those wanting to experience a true and authentic Japanese traditional performance. Moreover, I was delighted to see that I was the only foreigner within the audience, while most of the traditional ‘hot spots’ in Japan often full of tourists making the enjoyment of the sceneries harder. I would like to give a special thanks to Professor Fuse and his wife for inviting me to this performance.